The buyers of the club have refused to answer the Arsenal legend’s questions to the degree he would have wished. THIERRY HENRY’S FUTURE as the next Bordeaux coach has been plunged into doubt. For much of last week, it seemed that Henry was destined to take charge of the Ligue 1 side, but negotiations have become complicated for the Arsenal legend. The post became free a fortnight ago, following Gus Poyet’s outburst at the board, and while he is yet to have been formally dismissed, Henry had been hotly tipped to take over his position at the helm of the Europa League hopefuls. While some sources are reporting that the Belgium assistant coach has turned down the club, Goal reports that he is yet to break off talks entirely. The deal appears to have stalled upon the reticence of the club’s buyers to answer all of Henry’s questions to the extent he would have wished. 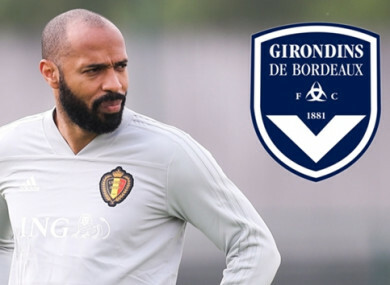 Bordeaux are in the process of being sold by M6 to a US investor group GACP, however, the latter have refused to give Henry the assurances he would have wanted. Specifically, they have not answered questions relating to his staff, the future of the club in the transfer market and his role at the club. Henry wishes to have control of Bordeaux in the style of an English manager, as Arsene Wenger was at Arsenal. He wants to recruit an experienced coach, a fitness trainer and someone close to him, possibly former Arsenal team-mate Gilles Grimandi, to direct the scouts of the club. President Stephane Martin is pushing for a deal to be done with Henry, and claimed that the club is turning into a soap opera. The chances of Henry becoming the coach of Bordeaux are, therefore, not yet dead, but they are certainly limited. Email “Henry’s Bordeaux move plunged into doubt”. Feedback on “Henry’s Bordeaux move plunged into doubt”.